Unger's restroom cleaning tools produce unparalleled results. You'll find mops, squeegees, sprayers, and brushes of all varieties. Whether your facility requires heavy duty deep cleaning or light daily maintenance, these tools get the job done. Most restroom cleaning carts are awkward, difficult to maneuver and are often poorly equipped. The RestroomRX System includes advancements in cleaning technology that make it possible to clean with confidence while increasing efficiency and reducing exposure to harmful germs. The lightweight and easily maneuverable RestroomRX cleaning cart is ergonomic and specifically designed to contain everything needed to properly service your facilities restrooms. The Unger microfiber mop technology eliminates the need for heavy, outdated and germ-spreading string mops and the dual compartment bucket system effectively cleans floors and prevents dirty water from entering the cleaning process. 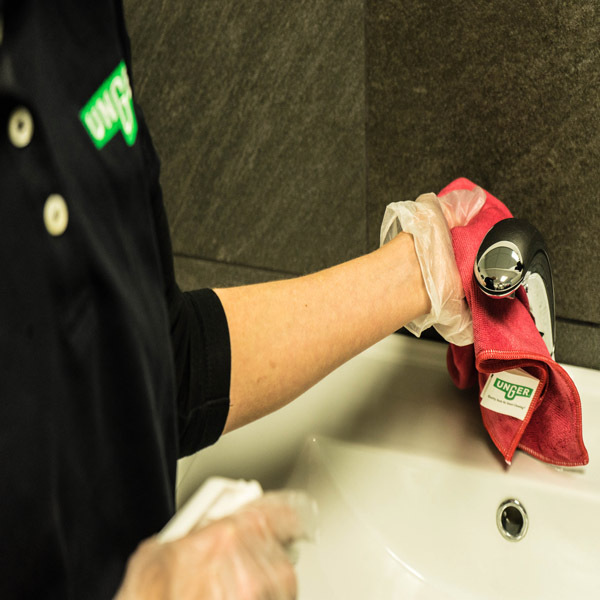 Microfiber cloths, brushes, cleaning pads and buckets assigned to clean specific areas in restrooms are quickly and easily identified by their designated color. Get started with Unger's restroom tools today for a deeper clean than ever before! Keep restroom fixtures sparkling with these cleaning supplies. Our variety of squeegees remove water quickly and efficiently from flat surfaces. MicroWipe cloths are perfect for hand cleaning, while the SmartColor Washer uses a microfiber sleeve and T-bar to absorb up to 6 times its own weight for quick liquid pickup. The Sprayer on a Belt lets custodians work quickly, optimally supporting the sprayer's weight. Get an even deeper clean for your restroom fixtures today! 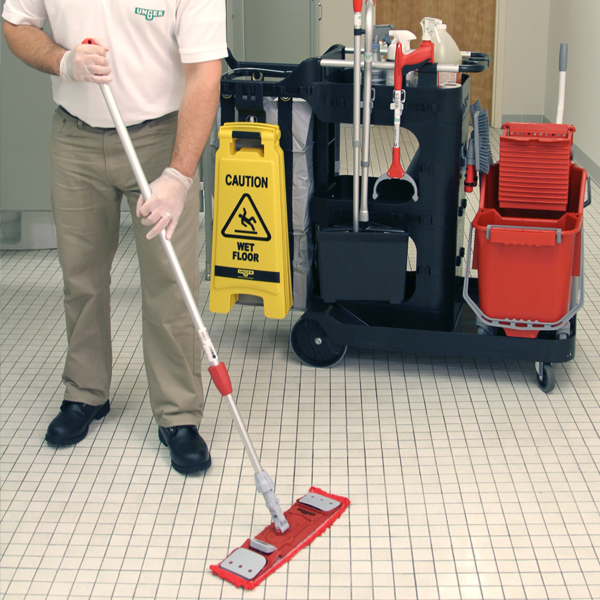 These ergonomic, purpose-built floor cleaning tools are essential for spotless restroom floors. Ergo brooms and dustpans quickly remove debris without requiring bending. Supplies stay organized with our selection of janitorial carts. Damp/dry mop pads are perfect for smooth floors such as tile, linoleum, or wood, while our swivel corner brush offers superior cleaning for corners and grout lines. Your restroom floors will sparkle when custodians use Unger cleaning tools! Unger's purpose-built toilet cleaning tools ensure the best results for your restroom cleaning jobs. Our ergonomic toilet brushes and swabs have longer, ergonomic handles for improved safety and reduced bending. Replaceable brush heads provide a 360ø cleaning surface while swab heads evenly distribute cleaning products. These toilet cleaning supplies are exactly what your custodians need to deliver the deepest clean possible.